There are various foods women can eat in order to have that hair they always desire. In previous post, i talked about how important it was for us (especially ladies) to be conscious about the health of our hair, just the same way we cater for our body. 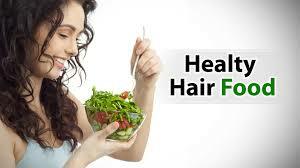 The type of food we include in our diet also assist in achieving a gorgeous looking hair. We shall be looking at some of them in this post, and the most important thing is that they are readily available in our markets and grocery stores. Therefore, there is no accuse for you to still maintain that ugly kind of hair after going through this post. In the quest of maintaining the appearance of the hair, all the ladies knew that using different hair products, blow-drying and perming, can all cause havoc on the hair. But they still continue to use them because they have no other choice of maintaining beautiful hair appearance. But i will like to ask a question. Are you aware that nutritional deficiencies can result to hair problems too? The answer is Yes. Maintaining an unhealthy diet can actually lead to hair dryness, brittleness, dandruff and hair loss. Many people are not aware of this fact, they believe that all the foods they eat, actually carries out its function on the body alone. They never have the idea that the hair actually prefers some type of diet we should be eating in order to have a healthy hair. It is of utmost importance to be eating healthy foods that are full of vitamins and minerals in order to support your growing hair. Now, let us look at some top 6 foods to eat for a healthy hair. The yogurt has an essential protein that maintains the health and strength of the hair. Additionally, the yogurt has the ability to boos the growth of slow-growing hair. So, it will be advisable to always eat yogurt, for a healthy and gorgeous looking hair. It have been proven that foods that are rich in omega-3 fatty acids have incredible health benefits to the hair, including making it to have a shiny strand. Salmon is one food that is highly rich in omega-3 fatty acid, including some others like mackerel, anchovies etc. Guavas are not the kind of fruit that most people enjoy, basically because of their seeds and hardness. Despite the issues of its hardness and that of the seeds, the guava is highly rich in vitamin C. And vitamin C is extremely necessary to protect the hair from breaking. Spinach is high in protein and vitamin A and C, which is used by the human body to produce oils in the scalp. Eating spinach on a daily basis can will always keep the hair moisturised. Eggs are highly rich in sulphur, which is important for the production of keratin and collagen. Collagen and Keratin are elements that are capable of assisting in creating and maintainig healthy and shiny hair. Pumpkin seeds are loaded with omega-3 fatty acids, zinc, and vitamins A and K, all these are essential for a healthy shaft. Pumpkin seeds are also good for the health in general. Like i said from the start, it should be unwise to still an ugly hair after reading this post. Subscribe to one or more of these top 6 foods, start eating them so you can have a healthy looking hair. You are welcome, and thanks for appreciating the post too.